Merlot has been much maligned with the notoriety it achieved after "Sideways". Forgotten, often, are the achievements it is capable of in the right hands, and place; Chateau Petrus comes to mind. 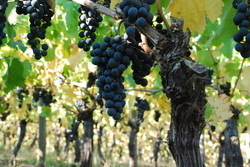 Also the fact that Merlot can ripen a good two weeks ahead of its brother, Cabernet Sauvignon. How does it do this? Merlot is a child of Cabernet franc and Magdeleine Noire des Charentes, a very precocious variety that could ripen as early as July 22nd (Saint Madeleines day in France). Magdeleine Noire des Charentes is also a parent of Malbec, and gives this variety its early ripening ability. Merlot was planted in the Carlo & Julian Estate Vineyard in 1996; in past vintages a portion of the fruit from these vines has been blended with our Estate Tempranillo, adding complexity to the blend. Starting with the 2009 vintage the Estate Merlot has found its way into the Estate "Six Grapes" blend, along with Malbec and Grenache that were planted in 2003, and Tempranillo and Nebbiolo that both date to a 1996 planting in our Estate Vineyard.